One of America’s great scenic drives is 17-Mile Drive on California’s Monterey Peninsula. As is the case with many of America’s scenic drives (some of our other favorites include the scenic Apache Trail and the historic Columbia River Highway), 17-Mile Drive has been a tourist attraction for a very long time. The first travelers along 17-Mile Drive explored the Del Monte Forest by horse-drawn carriage as early as 1881. Now visitors pay an entrance fee at one of five gates to view the Monterey Peninsula’s dramatic coastline, visit 17-Mile Drive’s 21 marked points of interest, and get a glimpse of what is probably the Monterey Peninsula’s most famous attraction, Pebble Beach Golf Links. We drove 17-Mile Drive during a visit to Carmel-by-the-Sea. It was a grey, drizzly morning, not ideal for walking around town, so we needed something to do and keep dry. Carrie Theis, the owner of Hofsas House Hotel, suggested we grab a picnic lunch at Carmel’s 5th Ave. Deli and spend the first half of the day driving around 17-Mile Drive. 17-Mile Drive is beautiful in both clear, sunny weather and grey, dreary weather. Bright sunshine and clear skies make for better pictures, but dismal, wet conditions highlight the powerful ruggedness of this portion of the California coast. We began our tour of 17-Mile Drive at Carmel Gate, just north of Carmel-by-the-Sea, and followed a clockwise route. The first stop reached from Carmel Gate is the famed Pebble Beach, which was hosting the Callaway Pebble Beach Invitational during our visit. The Lodge at Pebble Beach provides views of the 18th fairway and green of Pebble Beach Golf Links. Sadly Romeo, who loves golf travel, did not get to play Pebble Beach on this visit, but it was still fun for him to see the course in real life for the first time and catch a glimpse of PGA golfers on the course. Peter Hay Golf Course is a par-3 golf course open to the public. It is also a point of interest along 17-Mile Drive because of the 100th U.S. Open Monument, a 30,000 pound bronze sculpture by Richard MacDonald titled Momentum, dedicated at the 100th U.S. Open Championship in 2000. The sculpture portrays the athleticism of the complete golf swing and contains the name of every U.S. Open champion since 1895. Near Peter Hay Golf Course is the Pebble Beach Equestrian Center, which offers guided horseback riding experiences through the Del Monte Forest and along the Pacific Coast. Pescadero Point offers views of Carmel Bay and Stillwater Cove. The Ghost Tree is a gnarled Monterey cypress with a bleached white trunk and a ghostly appearance. The Monterey Cypress tree, once near extinction, is only native to the headlands of Cypress Point and nearby Point Lobos. The Lone Cypress has stood perched for over 250 years on a jagged rock outcropping overlooking the Pacific Ocean. As the living symbol of the Pebble Beach Company, which owns a large portion of the Del Monte Forest, the Lone Cypress is trademarked and images of the tree cannot be sold or used for commercial purposes. Crocker Grove is a nature preserve of native pines and cypress. The grove is named after Charles Crocker, creator of the original 17-Mile Drive. Cypress Point Lookout is another viewpoint overlooking the Pacific Ocean and the dramatic coastline. The lookout is closed April 1 through June 1 during the California Sea Lions birthing season. Looking out over the ocean you will actually be looking at Carmel Canyon, part of the 10,000-foot-deep Monterey Canyon and the Monterey Bay National Marine Sanctuary. Fanshell Overlook is another area that is closed during harbor seal pupping season. Fanshell Overlook is where we chose to enjoy our picnic lunch from 5th Ave. Deli, protected within our car from the mist, with a view of the white sand beach just outside our windows. This is where we also started noticing the houses across the street from the shore with yards of sand and ice plant. It was amazing to see how far inland the sand travels, with some high-dollar houses having small sand dunes for landscaping. Spyglass Hill Golf Course is another public golf course on the Monterey Peninsula designed by Robert Trent Jones, Sr. If you have better weather than we did, Seal Rock Picnic Area is a great place to enjoy a picnic lunch with an ocean view. Bird Rock is home to shorebirds, harbor seals, and sea lions. Bird Rock Hunt Course is now part of the Shore Course of the Monterey Peninsula Country Club, but used to be the site of an equestrian hunt and steeplechase competition. The area was also used for riding and saber practice by the 11th Calvary stationed in Monterey in the 1920s. Along the coastline, from Point Joe to China Rock, Chinese fishermen built lean-tos against the rocks from the late 1800s to early 1900s. Chinese immigrants were the first to commercially fish the waters of Monterey Bay and helped make Monterey a successful fishing port. Point Joe is the site of many shipwrecks because early mariners mistakenly thought it was the entrance to Monterey Bay. The turbulence caused by the rocky underwater terrain can be witnessed from the Point Joe viewpoint. Spanish Bay was once the campsite for the Spanish explorer Don Gaspar de Portola. This is another picnic spot as well as a great place to walk along the shore. Along Spanish Bay is the Inn at Spanish Bay and golf course. The Links at Spanish Bay is a Scottish-style course known for having a bagpiper close the course every evening. I’m pretty sure we saw the course bagpiper having a drink later that evening at Cypress Inn. After all, how many men on the Monterey Peninsula could possibly wear a kilt? We chose to exit 17-Mile Drive using the Pacific Grove Gate and continue along the coast using Sunset Drive and Ocean View Boulevard. This route passes through Pacific Grove, by the Point Pinos Lighthouse, along Cannery Row, and through Monterey, looping back to Carmel-by-the-Sea via Highway 1. However there are three more points of interest along 17-Mile Drive if continuing along the loop. Poppy Hills is another golf course on the Monterey Peninsula and is also the home of the Northern California Golf Association. Huckleberry Hill is one of the highest elevations in the Del Monte Forest and is covered in huckleberry bushes. Shepherd’s Knoll provides a view of the Santa Cruz Mountains and Monterey Bay. 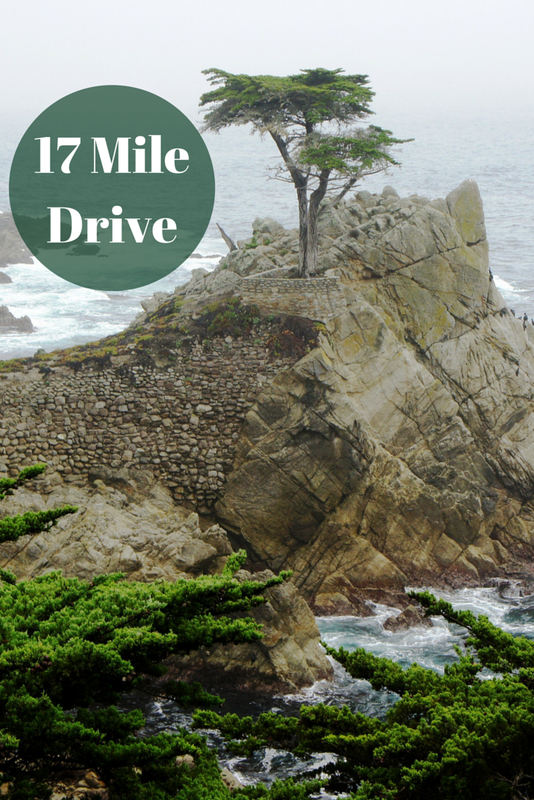 Currently the entrance fee for 17-Mile Drive is $10 per vehicle. Travelers can recoup the entrance fee by spending $30 at one of nine restaurants within the property. There are a number of streets branching off of 17-Mile Drive within the gates, but 17-Mile Drive is marked by street signs, wooden road markers, and a red-dashed line down the center of the road to keep visitors on track. Thank you to the Hofsas House Hotel for hosting our stay in Carmel-by-the-Sea and making this post possible. As always, all opinions are my own. This post contains affiliate links. If you book through them, it costs you nothing extra and we earn a small commission which goes towards running this website and bringing you more travel stories.